Well, it hasn't happened since 2004 vs. 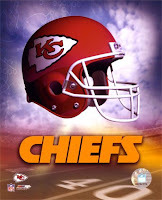 The New England Patriots but our Kansas City Chiefs have got themselves a Monday night game! The Chiefs will battle the San Diego Chargers in the home opener on Monday September 13th. Arrowhead will be full of surprises including a halftime performance by The KC All Stars, two time winners of the "Best Band in Kansas City" Award. The Chiefs game will start at 9:15pm. Too bad for all of the office Bobs and office Barbies - will have to call in sick for work on Tuesday. The Kansas City Chiefs have made several great moves this offseason, and everyone is excited to see who else they add during the NFL draft on Thursday. The Kansas City Chiefs are slotted to draft in the #5 slot. Names that have been dropped as possibles for the Chiefs are Eric Berry, Russell Okung, Bryan Bulaga, Morgan Burnett, and safety stand-out Golden Tate, who played for coach Haley in college. The Chiefs have already made great moves including bringing in our personal friend Ryan Lilja - who we can tell you first hand was not happy in Indy - as well as the tandem running backs of Thomas Jones and Jamaal Charles. Clark Hunt stated that "this would not be your usual home opener" so expect lots of surprises as Kansas City fans party late into the night on a school night at the Monday night home opener. Sunday, Nov. 7 at Oakland 3:15 p.m.
Sunday, Nov. 14 at Denver 3:05 p.m.
Sunday, Nov. 28 at Seattle 3:05 p.m.
Sunday, Dec. 12 at San Diego 3:15 p.m.